FALL RIVER, Mass. – Southcoast Health recently presented the Singular Distinction Award to three employees who helped to save a local man’s life at a community event in Fall River this past summer. 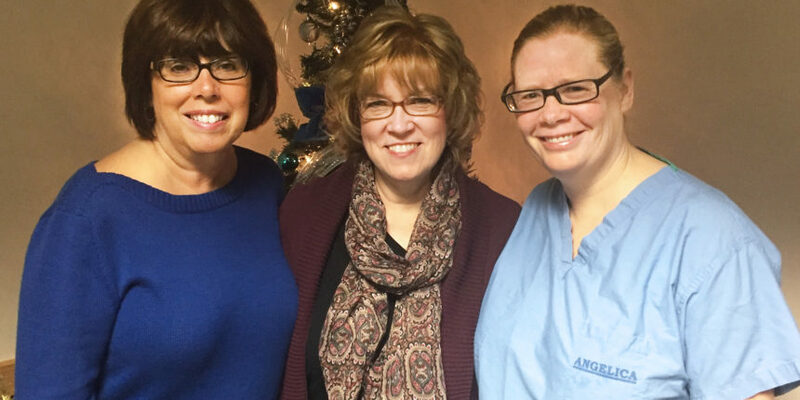 Kathy Cateon, LPN, Judy LaChance, RN, and Kathy McKenna, RN, were part of a small group that performed life-saving CPR on a 50-year-old man suffering from cardiac arrest. Cateon (Swansea, Mass. ), LaChance (Dighton, Mass.) and McKenna (Freetown, Mass.) were participating in the annual American Cancer Society Relay for Life at Bishop Connolly High School on June 26 when they encountered a man slumped over in the parking area. Along with at least two others, including a Fall River police officer, the trio performed CPR until paramedics arrived to transport the man to Charlton Memorial Hospital. The Singular Distinction Award recognizes Southcoast Health employees who, in a specific spontaneous act, deliver more than medicine. It also celebrates employees who provide an action that demonstrates kindness, compassion and caring to our patients, visitors and fellow colleagues.